This is the second in a series of posts about civic design, iconography, and branding. Some of these ideas I’ve had for awhile, but now with GOOD Ideas for Cities coming to Cincinnati I figure it is a good time to share. The first post in this series was about Cincinnati’s own typeface. Read it here. The flag design was the result of a contest and the winning design was selected in 1895, but not formally adopted until 1940. The blue color represents the river, the red “C” stands for Cincinnati, and the Buckeye leaf on top is for the State of Ohio. The symbols in the center of the flag all have significance and represent important qualities of a city. The Winged rod signifies commerce and the serpents represent wisdom. 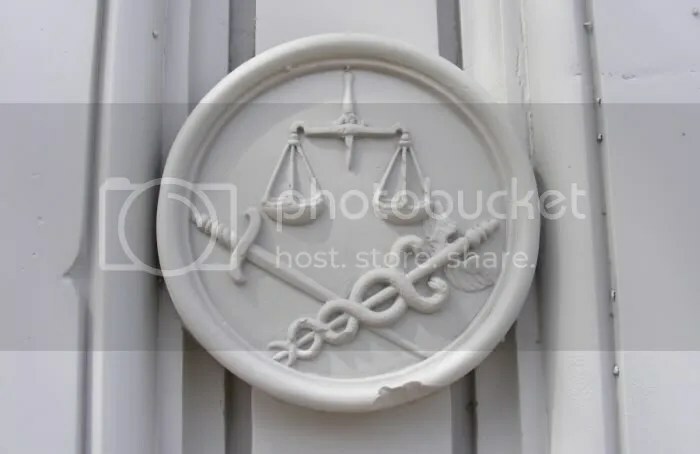 The scales signify justice and the sword represents authority and power. Lastly the phrase “Juncta Juvant” translates from Latin to “Unity Assists” or “It’s better to work together”. In the United States, I’d have to rate Chicago far and away #1 in the use of official civic symbols (maybe the best in the world for all I know), and also note the overall high level of design quality of these objects. Renn goes on to display a whole assortment of symbolic adaptations based on the Chicago flag. Chicago’s flag lends itself well to customization because it is both simple and recognizable. In 2004 the North American Vexillogical Association (NAVA) asked its members to rate the flags of 150 American cities on a scale from 1 to 10 based on his or her personal opinion about what constitutes a good flag design. 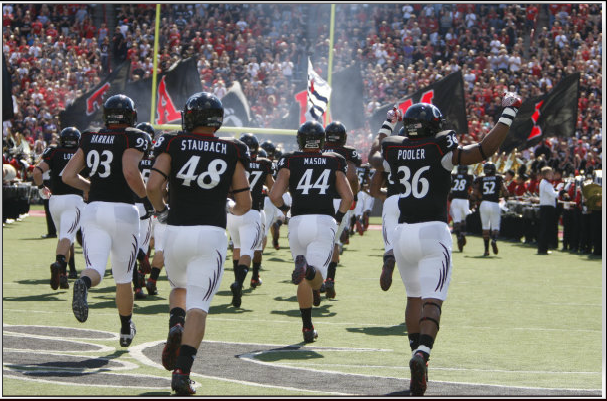 Cincinnati’s flag ranked relatively high at 22nd nationally. Washington DC placed first and Chicago came in second. Indianapolis and Louisville also placed well with ratings of 8th and 9th, respectively. The rest of the results can be viewed here. 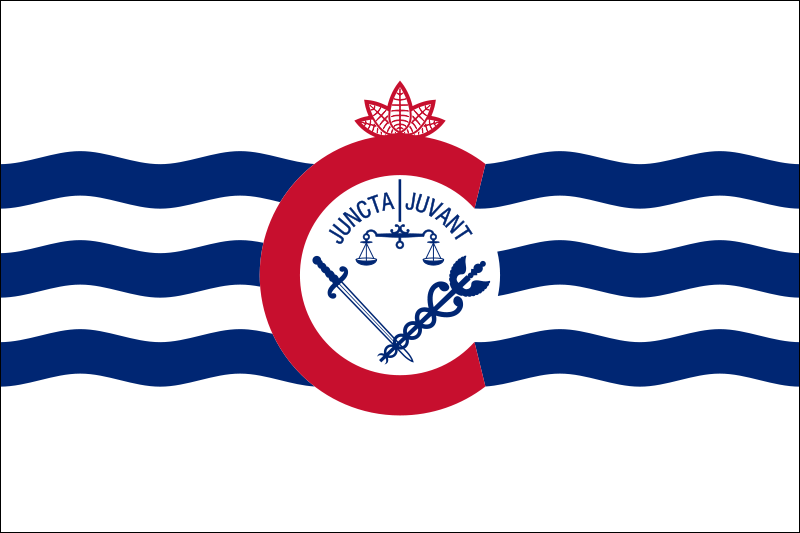 I think Cincinnati’s flag is charming. It’s uncomplicated and symbolic yet detailed and specific to Cincinnati. It lacks the stark simplicity of a naval signal flag which cannot be said for many other flags. Cincinnati’s flag design feels handmade and almost artisanal, like it wouldn’t be out of place hand-drawn in pen and ink for the Original Maker’s Club. That’s only my opinion, however. Someone who ought to know better is Ted Kaye, the NAVA survey’s organizer and Portland, Oregon-based author of Good Flag, Bad Flag. 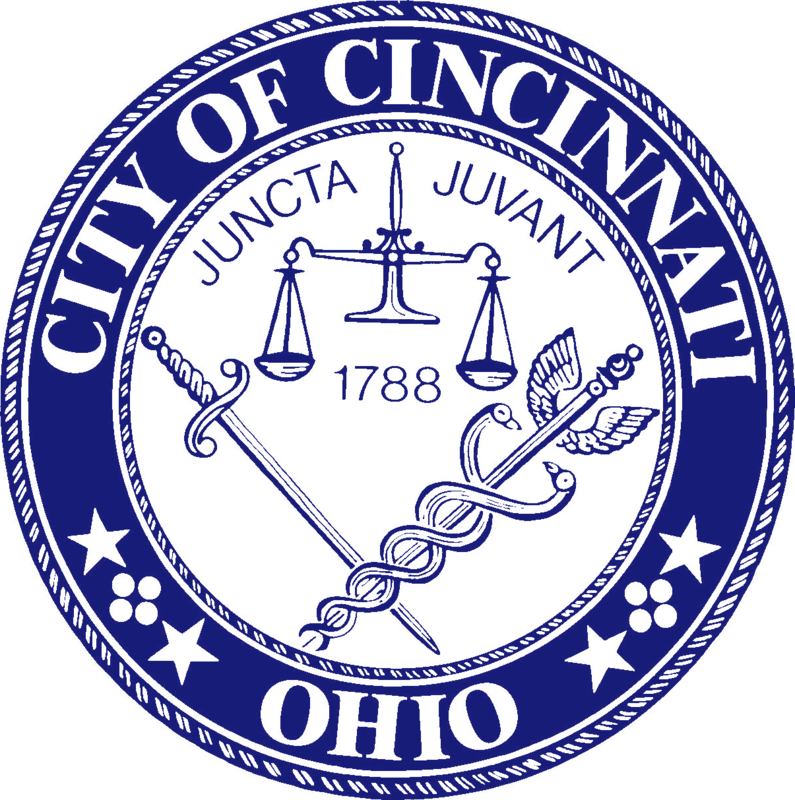 Back when the survey was released, the Enquirer quoted Kaye as saying, “Cincinnati’s flag scored well because it has a very modern look.” Tomato, tomahto. Regardless, Cincinnati has a nice flag. Indy has a pretty awesome city flag – it is even better than some countries’ – but you rarely see it. Private businesses and citizens should be encouraged to fly it as well. 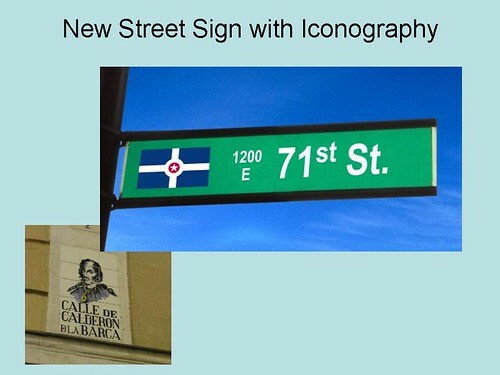 Design a new street sign that incorporates the city flag. How hard is that? Even better, use that as the base design, but if the street is named after a person or place, replace the flag with an artist’s rendering of the eponymous person, as in this example in the lower left from Madrid. Now imagine Cincinnati’s flag coupled with its own typeface on its street signs. How great would that be? That’s one simple and easy way to make Cincinnati more unique and attractive. The flag and seal aren’t as prevalent as I think they should be, but they’re not total absent either. The pillars at Washington Park also bear the city’s seal. 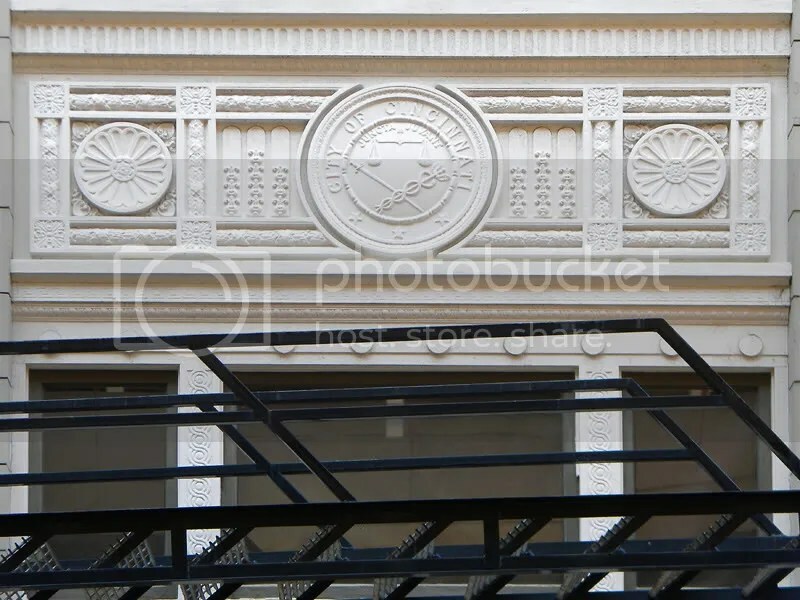 Here’s a pre-renovation closeup of the seal on the column. Once I obtain an image of a refinished pillar, I’ll replace this image. The colors of the 3 wavy lines (symbolizing the river) are the same as the 2 straight lines of the seal (symbolizing railroad tracks). 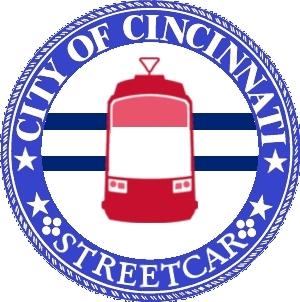 And the Streetcar logo is the same color as the “C”. Icons and symbols of a city help tell its story. They intrigue visitors, remind locals of our history, and cultivate a sense of place. Cincinnati’s story, it seems, has flummoxed even some of the city’s top PR pros. So much so that there’s an entire Story Project dedicated to developing Cincinnati’s “master narrative“. It’s an interesting campaign and one that I will discuss more fully in my next post in this series. Lastly, if you’d like to fly the flag of Cincinnati, you can buy them online and hopefully at a local flag store if you’re in the city. The National Flag Company at 1819 Freeman Avenue in the West End might be a good place to start your search if you want to support a local business. 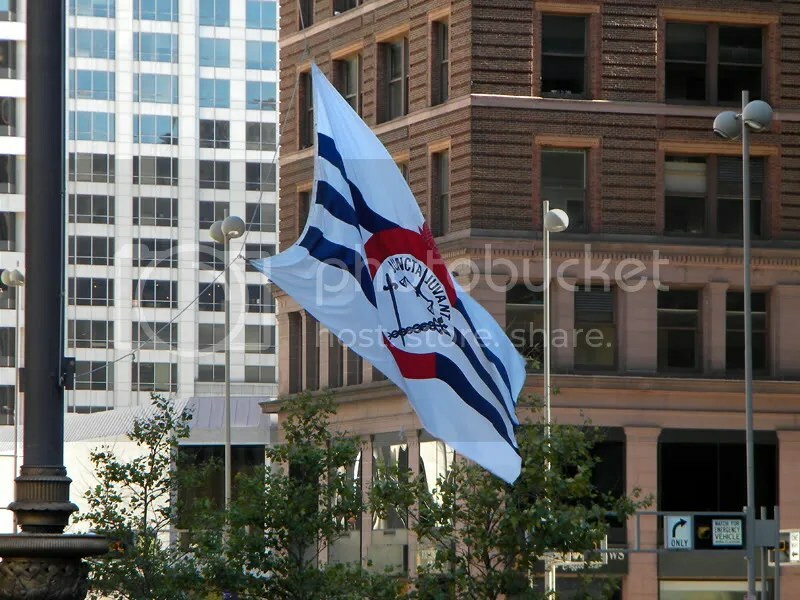 Know of a local flag shop that sells Cincinnati’s flag? Leave a comment, and I’ll update his post. Thanks! ← Could Cincinnati Benefit from Its Own Typeface? I’ve been trying to find a lapel pin made from the city flag. I’d much rather sport that than Ohio or even the U.S. flag. I’ll keep my eye out for a Cincinnati label pin – that’d be exceptional! The staff & snakes is a caduceus. 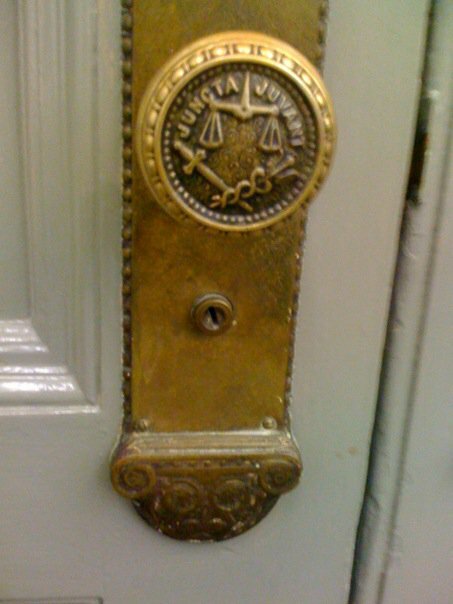 Usually represents Mercury/Hermes. That’s kinda cool, tho, what with the printing & broadcasting industries that came along in the city later on. My only issue with the flag is that I think it’s “skinny” & has too much white space. But you’re right, it could be used a lot more. Thanks, Quimbob. I think it could look a little busy if anything was added to it. Personally I think all the stuff inside the C make it look too busy to start. I’d like to see it as just the red C with the buckeye leaf tiara and blue river lines with the rest white. Simple and clean. This cleans up the interior nicely but the buckeye leaves should also be brought forward time. Perhaps they could larger and slip downward onto the face of the “C”.